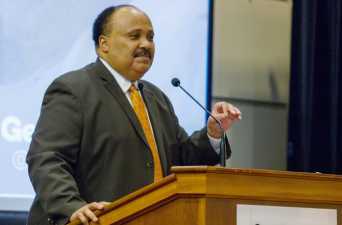 Martin Luther King III, the eldest son of the late Dr. Martin Luther King Jr. and Coretta Scott King, delivered a speech in the Student Center Ballroom Wednesday advocating nonviolent action when contending with the many social, political and economic issues facing the nation. Dr. Archie Ervin, Vice President for Institute Diversity, and Institute President G.P. “Bud” Peterson provided the opening remarks and official welcome for the event respectively. A prominent human rights advocate and community activist, King engaged in civil disobedience protests in his youth, later leading protests against the digital divide in the field of technology spearheading nonviolence initiatives across the world, among numerous other achievements. King cites his father’s example as a leader of the Civil Rights Movement when explaining the importance of peaceful mobilization. “Martin Luther King Jr., in a short period from 1955 to 1968, helped to transform our nation without ever using a gun…but instead by using his voice and the power of love to mobilize—to endure the suffering that he and team felt they had to endure. It was an incredible movement,” King said. Though King emphasized the significance of his father’s role in promoting social liberty, he also explained the difference between idolizing the man and cherishing his beliefs. “It’s easy to idolize Martin Luther King Jr., but with idols we put them on the shelf, look up to them and when the holidays come around we dust them off. Instead of idolizing him, we should embrace his ideals of freedom and equality for all human-kind, and work to change our society. Our challenge for the 21st century has been to continue to embrace his messages and fulfill his dream,” King said. In relation to the theme of this year’s MLK celebration at Tech, “The Dream and the Journey Continue,” King made a point of revisiting significant historical events of the Civil Rights Movement during his speech as well. He cited Rosa Parks and the Montgomery Bus Boycott as crucial examples in the fight for equality. Furthermore, he emphasized the strides that had been made with regards to social justice over the decades since the Civil Rights Movement, and the importance of remembering the sacrifices of those who came before. “It is said that a people that do not remember their history are doomed to repeat the mistakes of the past. So it’s important to realize that we are a much better nation than we were then, but we had to go through a lot of obstacles,” King said. In addition to the political and historical topics of his speech, King addressed the importance of service as a means of changing the world, as well as a form of collective mobilization for a greater cause. “[MLK Day] should never be relegated to one of the traditional holidays, largely because of the ideals that Martin Luther King Jr. shared and disseminated and embraced. He truly believed in service…and perhaps this weekend as we observe it, we will be engaged as a nation in service and begin to see our society transform,” King said. Keeping recent tragic events in mind, King stressed the importance of not giving into hate or acting upon opportunities to take revenge for wrongdoings, expressing his hope that our country’s culture of violence would transition to a culture of nonviolence and acceptance. “In terms of freedom, justice and equality, [my father] and his team found a way to extract the good out of people. He taught us how to love and how to forgive,” King said.